Opto-couplers are a decades-old technology widely used for signal isolation, typically providing safety isolation, signal level shifting, and ground loop mitigation. They are commonly used in a wide range of end applications, including data communication circuits, switch mode power systems, measurement and test systems, and isolated data acquisition systems. 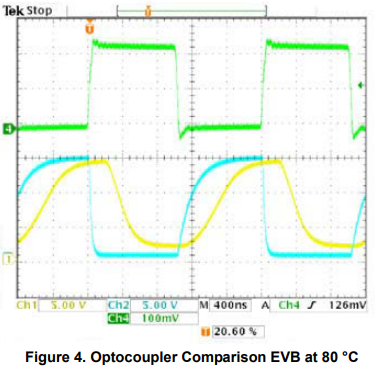 Optocouplers have several weaknesses, including parametric instability with temperature and device aging, significant internal parasitic couplings, long propagation delay times, narrow operating temperature ranges, and relatively low reliability. Today’s advanced CMOS signal isolation products offer better timing performance, higher reliability, and lower power consumption compared to optocouplers and are capturing sockets traditionally held by optocouplers. However, converting to CMOS isolation devices has, most often, required circuit changes and PCB modifications that cost money and create design risks, until now. This entry was posted on Sunday, March 31st, 2019 at 6:10 pm	and is filed under app notes. You can follow any responses to this entry through the RSS 2.0 feed. You can skip to the end and leave a response. Pinging is currently not allowed.